What a crazy day and a crazy way to relax. 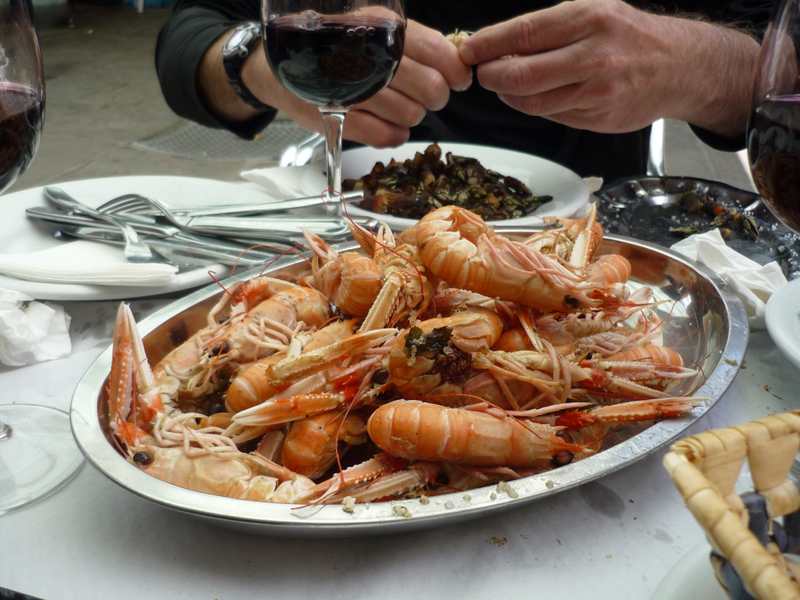 A perfect example of carpes diem or just seize the opportunity to eat, drink and be merry. 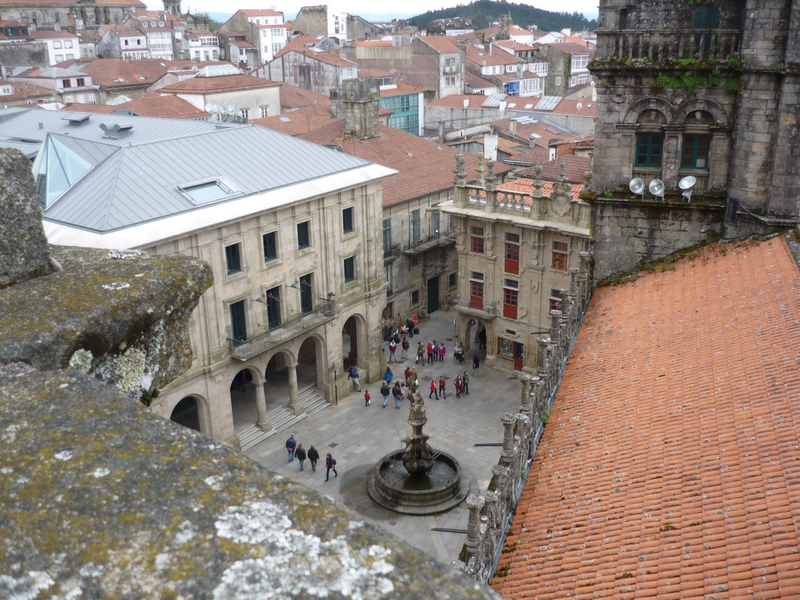 Dayton and I followed up a breakfast of fresh hot churros and tea with a visit to the pilgrims' museum and a tour of the rooftops of the cathedral. So far that was not the crazy fun part of the day. The rooftop tour was in Spanish and as boring as it was cold. Seriously the tour guide did not take a breath for one hour and all I got was a few 'nosotros' 'más o menos' and 'romanticos' and not one idea of what he was going on about. So much for my Spanish lessons. Afterward we met up with Paige and Janice. 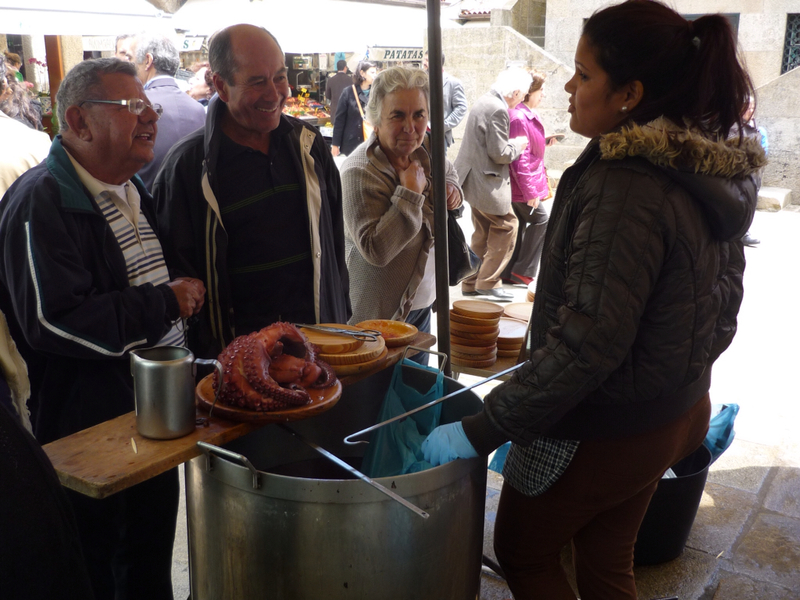 Paige took us to a local market, that she discovered tucked away in the labyrinth of streets in the old town and there they all had a most unique culinary experience. This market had a myriad of stalls of fruits, vegetables, meat and seafood surrounded and mixed in with lots of patio style tables and 'eating perches' and cocinas (kitchens).You order your seafood from the market stalls and then have the cocinas cook it and serve it to you. The waiters bring you back your cooked food with their bread and wine. There is a minimal service charge for preparing and serving, maybe 3€ a person and of course you have to pay for your wine. Dayton, Janice and Paige enjoyed, in order, octopus, barnacles, razor clams, raw oysters and then langoustines while I ate my weight in fresh rustico bread. There were a few glasses of vino tinto consumed and the sun was not over the yard arm yet. 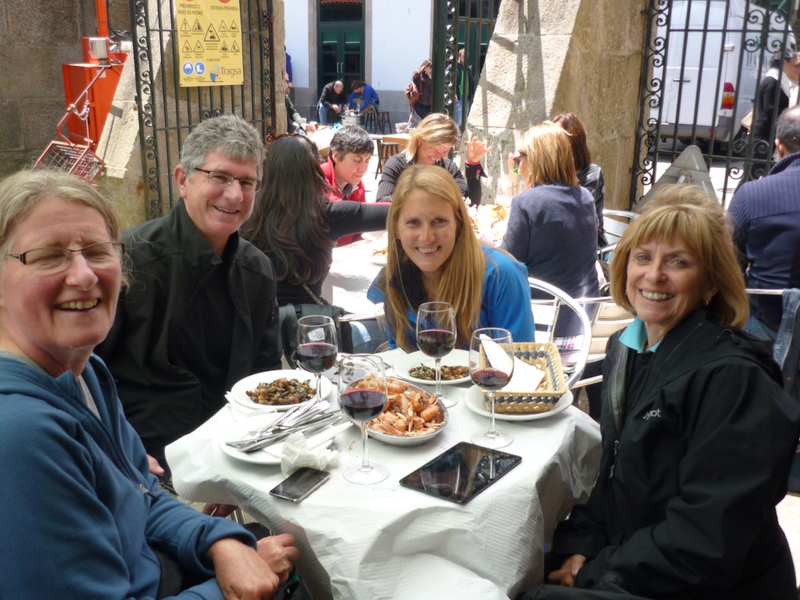 This will go down as a wonderful Camino memory. Another interesting Camino moment was later in the afternoon as Dayton and I were wandering the streets and shops. We were walking and heard someone call out, "Hey you, from London, Ontario"! We responded appropriately, "Yes, that will be us", and this couple introduced themselves and mentioned that they had remembered us from the Sunday afternoon talk at Novak's outdoor store that we had done in March the year before. 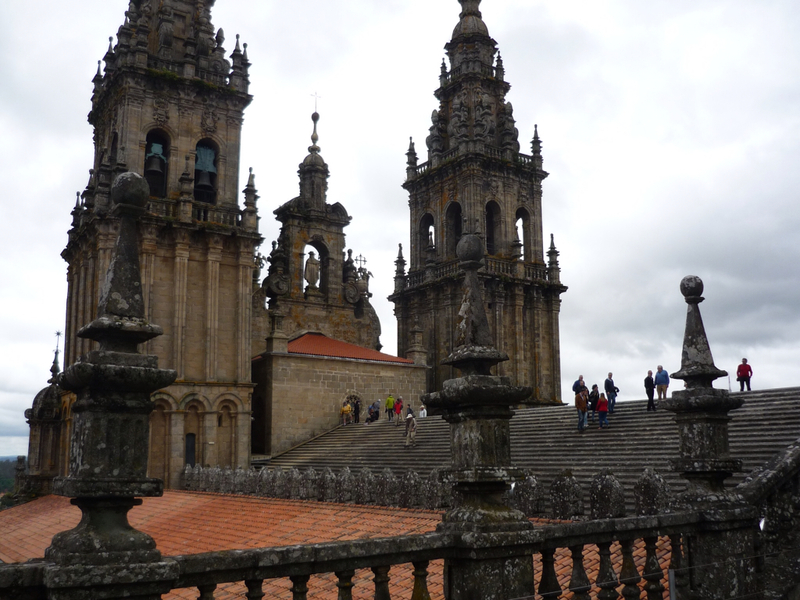 They had come to learn more about the Camino and here they were in Santiago having just finished their Camino Frances. 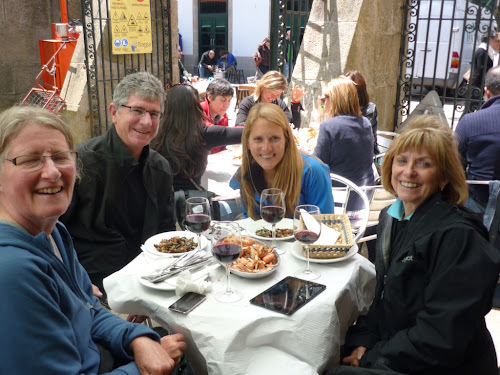 Interestingly enough this is how we first met Janice as well and all three were in Santiago at the same time as us. I'm hearing that song, It's a Small World After All, running thru my head! Looks like a lovely dinner for all of you!